The Doctor and the Daleks face off for the fate of Planet Earth. I know I’ll repeat this again in the end but this episode is completely brilliant. The characterizations, the story, everything was spot on. It was also the first time that filming was conducted outside of the studios. The empty city of London was a wonderful bonus for the story, showcasing the terror of a planet in ruins. Granted, there are always some cheesy aspects of the production. There’s a small animation sequence towards the end that amused me but as it fit with the storyline quite nicely, I didn’t think too much about it. The acting skills of all of the cast continues to be impressive. The facial expressions of Ian and the Doctor at the end of the first installment was breathtaking, even more so as the horror of their situation becomes apparent for both the cast and the viewer. There’s hints of the future Doctor in the second installment. Ecceleston was fantastic in that he would always be quick to the chase and was annoyed when no one else was. Hartnell’s Doctor begins to showcase this when he dismisses a fellow captive, pushing him aside when he continues to blather about without adding anything useful. The scene is a delight and wonderful for those who have come to Who first with the reboot and later for the early episodes. (And like many Doctor Who episodes, it never quite works out like you think it will). This comes up again in the later part of the episode when the Doctor stands confident and strong as a we see through the view of a Dalek his attack against the humans and the Time Lord. And like many future adventures of the Doctor, we find that it’s because he took a chance, a gamble, and won. This, again, begins to push the idea that the Doctor has moved from a runaway traveler to a man who will fight for injustice in the universe. I was initially worried about the Susan/David relationship but there’s genuine chemistry between the two characters that tugs at the viewer’s heartstrings. Even when the Doctor is confronted by David’s respect for an elder’s opinion, there’s a sense that David is attempting to impress a potential in-law. The entire sequence is adorable. The ending was very emotional and more prove that Doctor Who is more about heart than just science fiction. Barbara’s side story continues to show her strength as a character. One of the best scenes in this episode is when Barbara pushes through a Dalek barricade using a fire truck. When Barbara and Jenny, one of the fighters against the Daleks, are captured in the middle of the fifth episode, the woman who sold them out remarked that they would have been captured eventually. It was only because of Barbara’s continued belief of good character that is her downfall. It’s because of moments like that this that drama of the traveler’s situation becomes heartbreaking. Survivors are shown to be pitted against each other just for a chance to live. People will sell out each other just for a can of food. The idea of using the Earth has a spaceship is quite brilliant. 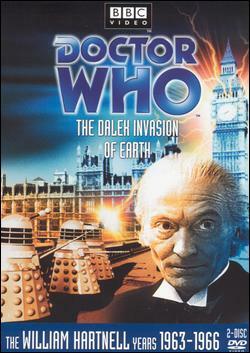 The question that I can’t help but ask is why did the Daleks choose Earth as their primary target? It’s not something that is discussed in the episode and only because I have knowledge of future episodes do I have a small understanding of their reasoning. I wonder if Barbara and Ian ever realized their role in the Time War that would consume the universe before the Ninth Doctor emerges. On a side note, the robomen look like early versions of Cybermen. I can’t help but wonder if they were the inspiration; even more so when David mentions that there is a transfer process from human to robomen. Overall, this episode is one of my favorites. The story and characters are engaging. The impact of this episode has a ripple effect to future episodes in regards to Daleks, companions, and the role of the Doctor as the protector of the Earth. Thanks to the discs on their backs, Daleks can now move without the use of magnetization on metal floors. The Dalek Supreme has a pet called the Slyther, a nasty creature that attacks Ian and Larry. Susan’s last adventure with the Doctor, Barbara and Ian. She stays with David to rebuild Earth and to create a life for herself.